A female patient was seen for consultation with her dentist regarding tooth #3.6 a. She reported that pain on biting had developed over the past week and intensified day to day. Her generalist took a peri-apical radiograph and advised the patient that “something” was amiss. A prescription for Amoxicillin (500 mg) was provided and she was referred to an endodontist. Tooth #3.6 was percussion sensitive. 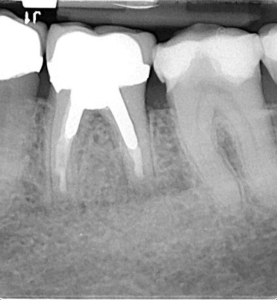 A two-dimensional radiographic examination revealed a prior root canal procedure, a PFM crown and cast post core in the mesial-buccal and distal canals. The suggestion of a second distal canal was noted (Fig 1). A cone beam tomography scan was recommended as the tomographic volumes would elicit more accurate diagnostic information; the patient concurred, and was referred to a radiologist (www.canaray.com). 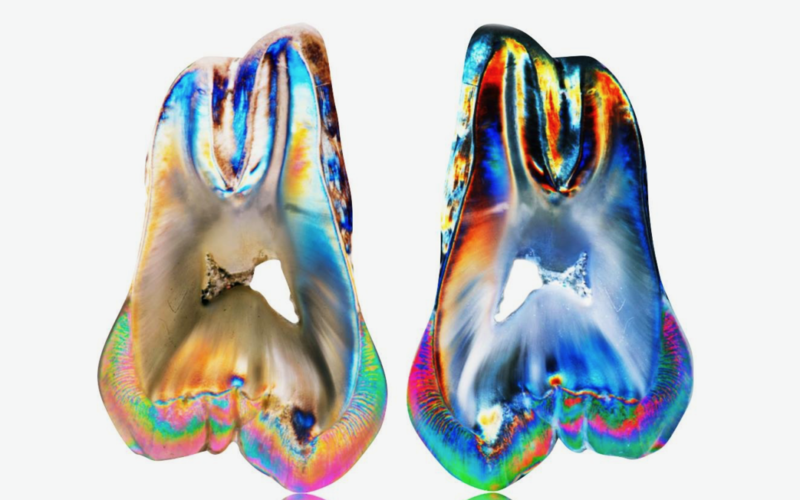 The cbCT showed that the apex of the distal root demonstrated rarefying osteitis. In addition, the apical third of the distal root was under-instrumented and under-filled which contributed to persistent apical pathology. The mesial root appeared normal radiographically (Fig 2). 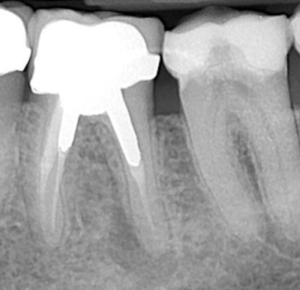 Retreatment as an option was discussed, however the risk factors involved, removal of the crown/post core and retreatment of the root canal system, were deemed have an uncertain prognosis. 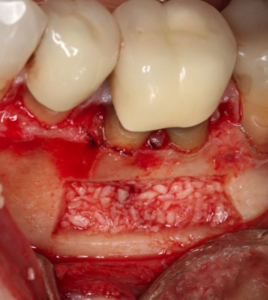 Other options were discussed including consideration for extraction and implant replacement. 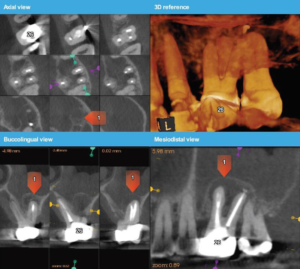 The patient agreed to have microsurgical treatment using a cortical window – a sagittal view (cbCT) was used to determine the width and height of the cortical window needed . The coronal view shows the facial lingual width and the position of the inferior alveolar nerve (Fig 3) – the relation of the lesion between facial and lingual cortical place determines depth of the surgical crypt and the its proximity to the inferior alveolar nerve. 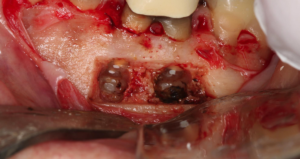 The clinical examination identified generalized recession and diminished attached gingiva about the facial aspect of #3.4 and the mesial root of #3.6. Anesthesia was obtained using Ultracaine hydrochloride with epinephrine 1:200,000 Articaine for the IAN block with Marcaine with epinephrine 1:200,000 for the second IAN block and Xylocaine 2% with epinephrine 1:50,000 was used for regional infiltration. A surgical operating microscope was used, the principals of modern microsurgical endodontics were applied. 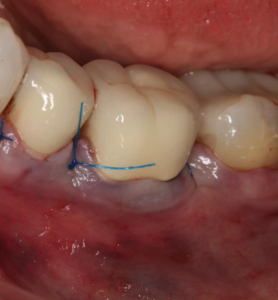 A full thickness intra-sulcular flap was incised with a microsurgical blade which minimizes trauma and loss of the interdental dental papilla especially in areas of recession and thin biotype. 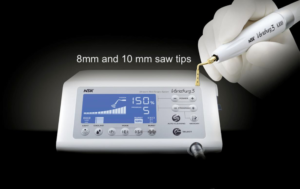 The roots were planed to ensure a clean surface and 25% citric acid applied for 3 minutes to enhance collagen exposure and to facilitate improved adherence of flap to the root. The piezotome was used to develop the cortical window. The cortical window was angled convergent from the external surface to the internal surface and wider at the base which prevents the plate from sinking internally when repositioned as discussed previously (Figs 4, 5). The window was removed and placed in HBSS (Hanks Balanced Salt Solution). 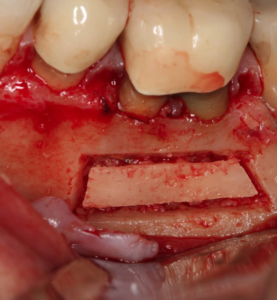 The apices are resected at a 0 degree angle preserving root length exposing the lingual anatomy, centering the canals, eliminating accessory canals and minimizing the number of exposed dentinal tubuli. The canal is retro-prepared, retrosealed using BC Putty (Brasseler USA) (Fig 6). Darwin’s theory of evolution is based on natural selection. The basic framework of endodontic surgery by incorporation of interdisciplinary precepts has evolved into endodontic microsurgery. Advances in the surgical armamentarium based on biological concepts has enabled a microsurgical approach which ensures enhanced positive treatment outcomes. The past is not being rejected; the future is being embraced. It is the natural progression of all things. Figure 1 – X-ray taken at presentation. Fig 3 – Coronal view is used to determine horizontal depth of the crypt and position of IAN. Fig 5 – WIndow is developed wider apically than coronally, section tapers in from cortical bone to medullary to ensure seating on replacement. Fig 6 – Apices are resected, methylene blue used to determine cracks, fins, terminus of untreated canal. Fig 7 – Crypt is filled with allograft. Fig 8 – Flap is sutured – primary closure. Fig 9. 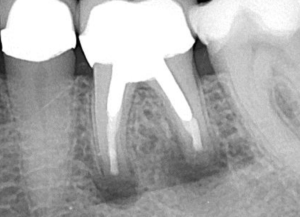 Immediate post-treatment radiograph. Fig 10. Six month followup.